The 1980s and most of the 1990s still had what I call “auteur comics”. It’s not micro-scale underground stuff (like, say, Cool Jerk and Homo Gal). 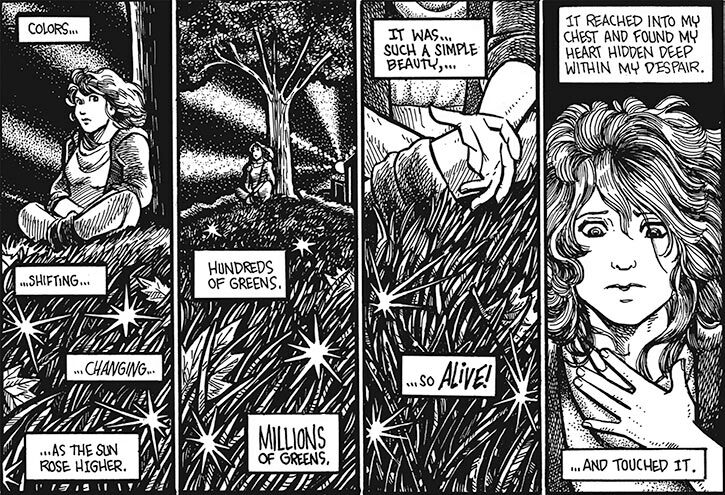 Webcomics (like Digger or Finder) weren’t a thing yet, and Crumb -style comix had receded. It usually existed just under tier-2 and tier-3 publishers (Slave Labor Graphics, Fantagraphics, First Comics, AC Comics, Eclipse…). So professional-level work, mostly by one or two persons, with a near-zero budget. Y’know, Matt Wagner’s Mage, early Bone by Jeff Smith, the original Teenage Mutant Ninja Turtles run, Love and rockets… Plus, mostly unfortunately, the wave of B&W comics that followed the success of TMNT. Another 1990s example was Wandering Star, by Teri Wood. It was an early work – she had mostly done a magazine strip before. Which makes the story’s sharp, confident quality remarkable. Beyond being a good science-fiction war drama, it also has this interesting vibe. It is steeped in sci-fi literature, yet avoids much of the “boy’s own fantasy” infrastructure that underlies the majority of genre stories. It’s much closer to a Bildungsroman . The story was *finally* collected, graphically polished and reprinted in 2016, so that’s good. This profile includes S P O I L E R S about the start of the story. But not about the main plot. Real Name: Casandra “Casi” Andrews. Known Relatives: President Samual Andrews (father), unnamed mother (deceased). More relatives appear later in the story. Group Affiliation: The Wandering Star crew. Base of Operations: Wandering Star. Height: 5’2″ Weight: 110 lbs. Casandra is intelligent, well-educated and resourceful… by realistic standards. She became a solid co-pilot and gunner aboard the Wandering Star. During her teens she received Junior Security Unit training. This seems to be light security/patrol training combined with basic hand-to-hand and threat management training. It’s more about not doing stupid things, and remaining collected, than about being Batman. The story is, in DC Heroes RPG terms, set in a realistic Genre. Nobody is a hero, violence has horrifying consequences, war is just a space where everything goes wrong, leaders make awful mistakes despite trying their best, etc.. It’s entirely obvious that Casandra isn’t going to solve the situation by grabbing a blaster and shooting all the bads. The Wandering Star is twice as fast as a high-end starfighter. She has multiple batteries of energy weapons, and at least one tractor beam. Onboard facilities include food synthesis (drawing from a reservoir of raw ingredients) and one-person workout room. This is a corvette-sized custom ship that may have been intended for fast transportation of VIPs. It was built from scratch by an excellent, highly experienced Naval engineer. Its performance is exceptional rather than merely excellent due to the presence of an energy lifeform “haunting” the Wandering Star’s computers. Her name is Elli. She can in some fashion “overclock” the ship’s systems so they perform well above nominal capability. It also means that she ship is very easy to operate, as the computers can handle most complexities. Elli likely can fly the Star on her own, and the ship can comfortably run with just her plus two crew members. Earth went through World War Three in 2070. Though the conflict was devastating, it did not destroy the planet. But after the war, the onus was to build bigger and better weapons “to ensure the peace”. And with this anxious focus, environmental issues fell by the wayside. Earth thus became uninhabitable. The rain, in particular, was deadly. Mankind survived by building “cityscapes”, a kind of arcology . With the ecological collapse, these forever existed at the edge of disaster. A world government became necessary to coordinate relief for damaged cityscapes. Earth was nearly finished in 2104, due to an American super-bomb called Weapon Armageddon. But unexpectedly, Humanity came together at the eleventh hour. It was agreed to have this ultimate form of mutually-assured destruction disarmed. First contact with aliens was apparently made in the 2140s. And in 2149, the Galactic Alliance offered a deal to Earth’s United Nations. Earth was a fluke. Generally, species with a warlike nature exterminated themselves and their homeworld before they could reach the stars. Thus, the Galactic Alliance species tended to be peaceful and collaborative, and didn’t know much about weapons. But another fluke, the aggressive Bono Kiro, was now attacking the Alliance. Alliance species thus turned to Earth. They offered membership, and promised environmental tech to heal the planet. The United Nations took the deal, and Terran weapons and soldiers were critical in winning the Bono Kirian Conflict. However, Terrans were widely seen as horrific by Alliance species. A bit like a race of kitten-torturing, self-destroying lunatics. Therefore the transfer of environmental tech was unbelievably slow, as were the steps in making Earth a full Alliance member. One Alliance tradition is the Galactic Academy. Senior officials of member species can send one of their children to study there, to create common ground and shared references between governments. The Alliance dragged its feet for four decades before even one Human could attend the Academy. 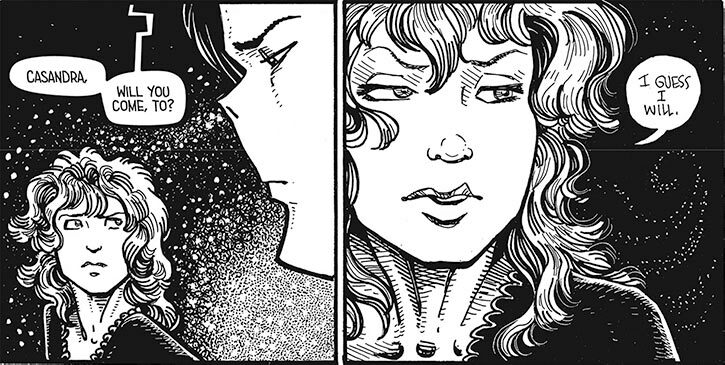 The universe of Wandering Star isn’t big on alterity. Alien species and worlds aren’t incomprehensibly different – it’s more like visiting another country. Most everybody is humanoid and can breathe the same atmospheres. On the other hand, food and drink should be checked for biological compatibility. The psychological differences are present, but figuring out cultural values isn’t too complicated. Most everybody wears clothing that isn’t terribly different from late XXst century Earth garb, alien children play recognizable ball games, etc.. Most people have occupations and interests resembling those on Earth. The tech is general space opera level, à la Star Wars. Some species can have psychic powers, but this is rare. Somebody with genuine psionics , like Casandra’s friend Madison, is the subject of major scientific curiosity. Casandra Andrews is the only child of Samual Andrews, the President of the United Nations. Her mother died when she was a kid. The President is based in an historical building called the Grand Mansion. It is the successor of the White House, which presumably was destroyed during WWIII. The Grand Mansion became part of the Cityscape Courageous. Casandra was born circa 2175. As a teenager, she led one of the six-person Junior Security Units in the city. These patrolled, and reported crimes to the actual police. Junior Security seemed comparable to Guardian Angel neighbourhood patrols, albeit for teenagers – and supervised by the government. This was an important formative experience for Casandra. She and other youths were proud of serving. In 2192, she was the first and only Human allowed to attend the Galactic Academy. Being the President’s daughter and all. Andrews thus found herself in a confusing, alien environment – as the sole member of a reviled species. She was also bullied by one Mekon Dzn Appogand, yet strove not to show any aggressiveness. Since she tried — not quite successfully — to avoid the racial stereotype. Her complete social isolation ended when she befriended one Madison. He was an extraordinarily powerful psychic lad from the planet Fobe. Graikor, the project lead, a wise and open-minded older fellow. Grai quickly became Casandra’s friend. Elli, a Trillian – an energy being who could inhabit electrically-powered systems such as computers. Outside of the ship, Graikor always carried a small speaker for Elli to interact with the others. Elli was a big fan of computers and starships. In 2193, the real Bono Kirian attack came. The 2149+ attacks had been an accidental foray – not a real assault. The first strike was sabotaging the communication relays. With the Alliance being by Human standards an indecisive and passive bunch, lack of proper communications pretty much paralysed them. At that point, Casandra and her friends were doing a test flight on the Wandering Star. Madison sensed that the carnage had begun, and Elli used a propulsion hack to outrun Bono Kiro fighters. With Madison locating enemy forces by thought, Casi and Graikor piloted the Wandering Star past enemy lines. It took three weeks to reach what was left of Alliance turf. Once there, Andrews was in for another shock. Along with the Academy — a trove of high-value hostages — Earth had been a priority Bono Kirian target. It thus had fallen in the earliest stages of the war. Though the situation was by then clear, the Alliance just couldn’t perform the cranio-rectal desinsertion necessary to achieve war footing. There thus were remarkably few assets to repulse Bono Kiro intrusions. The most solid Alliance platoon was the Wandering Star plus Human fighter pilots. Most pilots were miners who had been hired by non-Terran companies before the war. One was Joey, who had been a friend of Casi back in Cityscape Courageous. 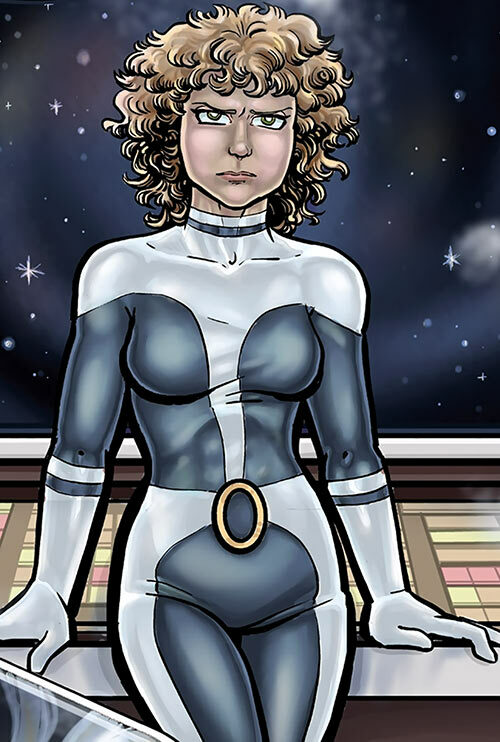 Casi served as co-pilot and gunnery officer on the Wandering Star. The crew developed a camaraderie to withstand the harrowing conditions. Casi is a petite, fair-skinned teenager with wavy hair. At the back is a long queue. She is fit, likely in parts thanks to Junior Security Unit training and requirements. The uniform in the main illustration is a Junior Security patrol uniform. But in most circumstances, she instead wore a variety of casual outfits. That she’s Human is something most people will clearly notice. Even onlookers who can’t readily identify her species will be a bit surprised to see somebody who’s not from the usual Galactic Alliance races. Early on, Casi is a nice and friendly kid in a rough situation. She kvetches a lot and feels terribly isolated, but puts on a brave face and mostly stays collected. Most of the early character arc that follows is about endurance, learning to handle stress and isolation, growing up, and friendship in trying times. Still, she remains young and somewhat naïve. She also runs into bad guilt issues caused by the deaths around her. Early Casandra Andrews is an everywoman. Like, say, Bella Swan, she doesn’t have a strong characterisation. Thus, she can serve as an identification character for a broad variety of readers. “Splendtacular” is her favourite adjective. It’s one of the few altered words used in the story (along with different spellings for some first names) to signal that it’s the future. The story is told using a framing device – an interview with a much older Casandra Andrews. *This* version of Casi has a far more defined personality. She’s a weary, frank, burnt out, disillusioned survivor and veteran. She greatly misses Earth and lives very much alone in a small apartment, with a pet that seems halfway between a puppy and a miniature pig. Casandra has a specific need to relate to nature, having grown up in an arcology on a devastated planet. A recurring motif in the story is Humans wanting to stand outside in the rain. This would be a death sentence on Earth, and Humans know they only have themselves to blame for this. She is bitterly aware of how much Humanity has screwed the pooch. And while Galactic Alliance folks sure like their decorum, older Casandra never hesitates to point out their hypocrisies and failures. Still, she knows for fact that it is possible to grow past these failures to become better, kinder civilisations. Learning how to handle loss and despair. Gaining more power over her emotions and those of people around her. Achieving a form of collaborative leadership. Dealing with her father’s legacy. Dealing with crises of her informal faith. Learning how to come up with unexpected strategies despite the fear. Familiarity (Galactic Academy curriculum), Language (Galactic Alliance). 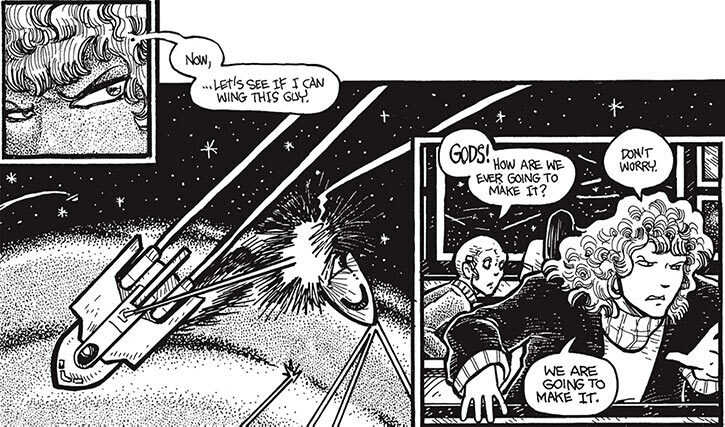 Wandering Star squadron (High), President Andrews (High). 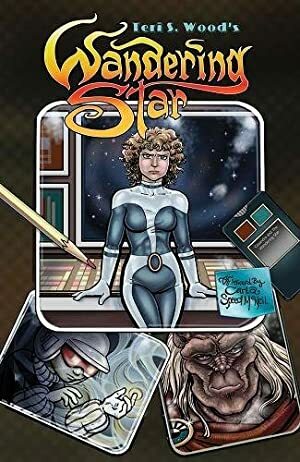 Source of Character: Wandering Star (Dover reedition). Writeup completed on the 19th of November, 2018.